Join Star Flyer for an exciting transit of the Panama Canal and a grand tour of the Caribbean islands. Enjoy a thrilling transit of the Panama Canal before sailing to the remote San Blas Islands. Visit the magnificent UNESCO World Heritage Site of Cartagena, stroll along the palm-lined streets of Oranjestad, Aruba's capital, and admire the magnificent colonial Dutch architecture in Willemstad. There is time to relax on the 'barefoot' island of Jost Van Dyke before mooring in the stunning bay at Soper’s Hole. Massive boulders are strewn along the sandy beach at Virgin Gorda’s famous 'Baths' and luxury yachts line the harbour in Gustavia, capital of glamorous St Barts. Embark Star Flyer in Panama. 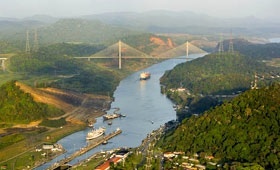 The transit of the Panama Canal is a thrilling experience. Stay on deck and watch as your ship navigates the mighty canal. These remote coral atolls are home to an independent people who value their communal culture and artistic heritage. The reefs around the archipelago offer fantastic diving and snorkelling opportunities. Enjoy the ship's facilities on a relaxing day at sea. Cartagena is a UNESCO World Heritage site with a superb collection of colonial buildings. Highlights include the old walled city, the 17th-century fortresses, the Palacio de la Inquisicion and the dungeons of Las Bevedas. Enjoy the ship's facilities on relaxing days at sea. Aruba's charming capital is easy to explore on foot, with palm-lined streets and brightly-painted Dutch colonial buildings. Aruba's stunning beaches are ideal for relaxing, or try out the amazing diving opportunities. Willemstad is home to 17th and 18th-century colonial Dutch architecture. Explore the island's elegant plantation houses, lovely beaches and numerous forts, including Fort Nassau, built in 1797 and now an international restaurant. The floating market in St Anna Bay sells mangos and papayas. Tiny Jost Van Dyke has some of the best and least crowded beaches in the Caribbean and a relaxed atmosphere. Later, moor at the yachting centre of Soper's Hole which is set in a stunning bay. Virgin Gorda was discovered by Christopher Columbus in 1493, and is noted for its tranquil bays, sheltered beaches and indigenous plant-lined walking trails. Perhaps hike to the island’s highest point, Gorda Peak, for panoramic views of the surrounding islands. St Barts was once a trade port where booty from sea raids was stored or sold. Now it is home to luxury yachts owned by the world's wealthiest, and the stunning capital of Gustavia has upmarket boutiques and good French restaurants. Disembark Star Flyer in St Maarten. Save up to 20% on Winter 2019/20 departures PLUS exclusive £50pp discount on all departures!